RKK Energia officials currently plan to make another attempt to launch the Progress M1-5 cargo ship toward Mir on January 24, if mission controllers in Korolev can reboot the main computer onboard the station in time. The Salyut 5B computer inside Mir's core module provides commands to the station's working gyrodines, which orient the outpost in space. Before the latest control system shutdown earlier this week, 10 out of 12 gyrodines were online. After initial testing of the Salyut 5B on Thursday, the ground controllers were convinced that the computer is in healthy condition and the new set of instructions could be uploaded into the machine on Friday and Saturday (Jan. 19 and 20). If this operation is successful, the station's working gyrodines could be brought back online, restoring the attitude control. The officials now believe that high temperatures inside Kvant-2 module most likely caused the energy supply failure onboard Mir early Wednesday. In the current phase of its orbit, Mir receives more than average exposure to the Sun, while thermal control system onboard Kvant-2 experiences problems. High temperatures in the module could cause abnormal performance of the electrical batteries and they were automatically shut down by the onboard computers. RKK Energia officials still hope that they will be able to restore full control over the station and avoid sending an emergency crew to Mir. Several factors complicate mission control's efforts to restore Mir's normal operation, RKK Energia officials said. Since December the technical problems with one of the transmitters onboard the core module interrupt a flow of flight control data from the station. A backup transmitter is available onboard Mir, however it has to be installed by the crew. On top of technical problems, the winter temperatures as low as -50C degrees in the Russian Far East complicate the work of ground control stations providing radio contact with Mir. 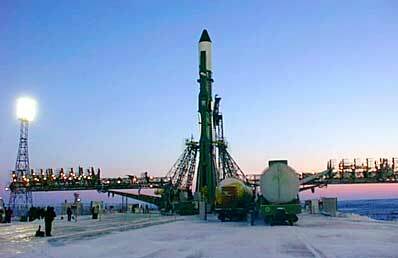 As ground controllers try to reactivate Mir's computer, the Progress M1-5 cargo ship remains on the launch pad in Baikonur. Launch on January 24 would occur at 0428:40 GMT (11:28:40 p.m. EST on 23rd) with docking three days later on January 27 at 0830 GMT (12:30 a.m. EST). If the Progress M1-5 does take off on January 24, the Progress M43 spacecraft currently docked to Mir will leave the station within 24 hours. The craft, however, will remain in orbit until its successor docks with Mir. The Progress M43 carries air supplies and food rations, which could be used by the emergency crew if situation requires.